Wintergrasp was one of the great success stories of Wrath – a PvP zone with epic battles between hundreds of opposing players. Hundreds. The Battle for Wintergrasp unified factions on servers like no event before or since. The call would go out in Dalaran that the battle was starting. “Please start a new raid, this one is full!” people would cry out in the prep rooms, and if you were smart, you used addons to create those raids. Every two and a half hours servers would come together to beat the crap out of each other on the frozen fields of Wintergrasp. This is not to say Wintergrasp was not without its problems in the beginning – do you remember driving siege engines through the walls? – but it was an immediate success on a scale that Blizzard was not prepared to handle. Wintergrasp caused Northrend servers to crawl during good battles, and crash during the really big ones. The lag during larger battles never really went away, even when WG went to an instanced battleground. Wintergrasp was an immediate success, and somewhat unexpectedly, it stayed successful for the entirety of Wrath of the Lich King. Tenacity and the self-righting mechanics allowed outnumbered factions to compete. The map is interesting and requires players to make choices about what to attack and what to defend. The southern towers required attackers to make choices about how much strength to commit to offense versus defending the towers, while giving the defenders a reason to leave the safety of the Keep. The Keep itself is large enough to prevent a concentrated buildup of defensive forces, requiring defenders to make positioning choices. But most important of all, Wintergrasp gave players an incentive to participate. There’s a fundamental difference between PvE and PvP encounters: motivation. A PvE encounter has to offer a reward for the players to make them want to do it. Justice Points, badges, gear, achievements – whatever it is – all these things are offered as incentives for players to engage in, and defeat, the PvE encounter. In PvP, however, you have to motivate both sides to play, winners and losers alike. Think of it as having to pay raid bosses to show up to be loot pinatas. You can’t have PvP without the other players, and they have to have a reason to show up. Wintergrasp did this extremely well. Not only did it reward victory extremely well – a zone-wide XP buff, Stone Keepers Shards for heirlooms, and tokens that let you get great gear – it rewarded failure, too. People wanted to win, but even if they lost, they still got both honor and tokens. Victory was rewarded well, but failure wasn’t a complete waste of time. This brings us to Tol Barad, Cataclysm’s PvP centerpiece. The goal is simple. 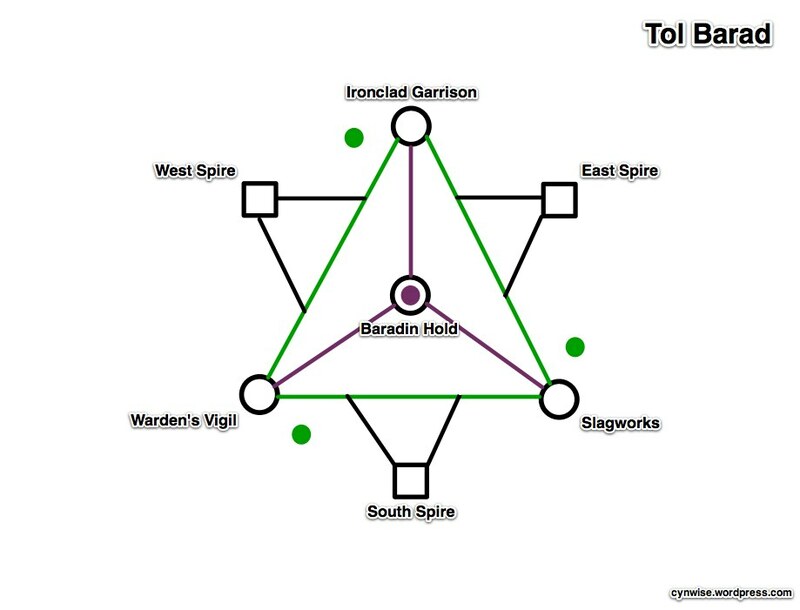 The attackers (who use the green graveyards) need to take and hold the three outer nodes (Warden’s Vigil, Slagworks, and Ironclad Garrison), while the defenders (who use the purple one in the center) need to prevent this. The 3 towers (Spires) can be destroyed to add time to the clock, but they’re not really important. To capture one of the outer nodes, you need to have more players in that area. You don’t have to be winning, you just have to have more players around it. The more players you have, the faster the bar swings to your side. There’s only one problem: Tol Barad is broken. Gevlon warned folks 10 days ago to stay away until it’s fixed. Mat McCurley over at WoW Insider has an excellent analysis of the six problems affecting Tol Barad, as well as solutions to fixing each one of them. Both of these posts are worth your time to read, especially Mat’s WI post. Look at that map again. The defensive strategy is simple – send all of your forces along a purple line to the node where the attackers are weakest. The attackers, in turn, will have to keep circling around on the green lines, trying to outnumber the defenders at any one point. But the defenders will always be able to get to a new node first. The attackers have the tactical advantage at the node due to the nearby graveyard, but the defenders have the strategic advantage for the battle. “I don’t believe in no-win scenarios,” a famous starship captain once said, and I don’t either. Attackers can win Tol Barad, in theory. It’s just really, really, really hard. It involves subterfuge, deceit, spying, and being as underhanded as you can manage, but you can do it. But even though it’s possible, it’s just not worth it. I remember looking over the gear I could get from Tol Barad and wondering where all the PvP equipment was. I mean, for a place that you have to fight tooth and nail for, why would I want to even bother? Some daily quests? The incentives are all wrong. I would rather spend my time in battlegrounds grinding out Honor and Conquest points than fighting for Tol Barad. I should not be ambivalent that the opposite faction controls Tol Barad all the time on my server. But I am. What is in it for me that I can’t get elsewhere? Wintergrasp hit the rewards perfectly. Not only did you get access to a raid boss for winning, but you got heirlooms for the PvE crowd and good offset pieces for the PvPers. And the losers had a reason to participate – even if you lost, you edged closer to that gear, and eventually you’d win and be able to buy it. Tol Barad, frankly, doesn’t offer me enough to make it worth the effort. I was having a good night in the battlegrounds earlier this week, so on a lark, I queued up for Wintergrasp again, and joined into a 5v5 running battle across the entire zone. Wintergrasp doesn’t really work as a 5v5 Arena, but I saw a few familiar faces in there (mostly on the other side) and enjoyed securing workshops, building catapults (hey, it’s all we could afford), and trying to survive long enough to get some damage done on the walls. It was fun, but not very good. Small WGs favor the defenders, heavily. But I knew that if we put enough people in, on both sides, it would have been a fair fight. You may not be able to do as much with only 5-10 people per side in Wintergrasp, but you certainly could take the keep with a little bit of work. Not so for Tol Barad. The strategic problems are such that if you have 1 person, or 80, the results will be the same. I love the idea of Tol Barad. I want to see it flourish, to thrive, to be the reason I log in at specific times each day. I want it to put Wintergrasp to shame, because Wintergrasp’s time is gone. But for now, Tol Barad is just a pale ghost of Wintergrasp. I Loved WG. Maybe it was because it was the one PvP activity that alliance won a good deal, and it was so easy to make great honor there. More then that though, it was just fun. Tol Barad, is not fun. It reminds me of Arathi Basin which is by far my least fav BG. And yes it is a bit skewed that the only PVP items from the vendor are the weapons, and the items that drop from the VoA like Raid boss. I actually think making TB a resource-based game like AB or EotS would help change the dynamic enough to keep people moving. Great post, Cyn; like a lot of people (I think) I haven’t even tried Tol Barad yet because of the legion problems I’ve read and heard about. Here’s hoping it all gets worked out! It’s funny. This post started with the map; I’m working on maps for all the new BGs, and I figured I’d do Tol Barad first. I read up on the rules drew the map, and then stopped. “That can’t be right,” I said. Then I started talking to other people about their experiences (‘wise is still leveling, she’s not yet taken part in the battle). And, oh my goodness. I was going to hold off publishing this until I had a few fights under my belt, but Mat’s article on WI (and some comments Adam Holisky made on Twitter) pushed me to finish it up early. Players need to understand /why/ Tol Barad needs to be fixed, and why fixing it needs to be a priority for Blizzard. It is the PvP centerpiece of the expansion, the one place where people who don’t want to do Rated BGs can go, the PvP place where raiders and levelers and achievement hounds and mount collectors and PvPers alike will all go. Like you said – here’s hoping it all gets worked out! I tried it. We were attacking and won but it was HARD work and I haven’t been back. I hope they fix it. I miss Wintergrasp. I loved healing that BG. Nice post, thanks! I think WG’s strength was that it catered to so many different play styles. Liked healing but didn’t like PvP? It’s total chaos, just toss heals around in the melee around the gates. Liked PvP? Go fight down south. Undergeared? Climb in a cannon. Would love to know how you won, by the way! Everything here is absolutely true. Not only is attacking stupidly unbalanced, but this even leads defending to be immensely boring. Defending is 20 minutes of, “Go to Slag. Now we’re getting overwhelmed. Go to Ironclad. Now we’re getting overwhelmed. Go to Vigil,” ad nauseum. It’s like an extended game of musical chairs with three chairs and nobody ever takes them away. I love that analogy! Yes, it’s boring. That’s I think the most damning problem of all: TB isn’t fun for anyone right now. I’d rather be leveling my Tailoring than fighting in TB, and that’s just not right. Been waiting for you to do a piece on Tol Barad and then somehow missed it >.< But as usual, an excellent post, thank you! I've personally managed to get in a few TB battles in the last few days, and have been pondering the "fun" part. Attacking is definitely more fun and involving because you really feel you're fighting that timer, but it's also *hideously* frustrating; I've only been in one successful attack. If defense is like musical chairs then attacking is like chasing someone around a circle when they start on the other side of it. How did we win? Uh, well, I guess we zerged better than they zerged – the last base ticked over to us with 30 seconds on the timer and the defensive zerg trying to hold onto the last base for the final minute rather than risk going elsewhere. Defending is a lot less fun, partly because it feels like cheating when your base gets overrun and you just wander off down the road to the one they just left, while waiting for that clock to tick down evvvveeerrr so slooowly. On defense, the timer is a triviality – giving you some chance to screw up rather than a goal to win – because you don't really have to work that hard to win as defense. Conversely, because defending usually leads to a win, there's more motivation to take part (3 emblems and control of the zone) and more reward for your yawn-inducing half hour of play. Having said that, I play damn hard when I'm defending, but that's more because I'm relearning PvP and take pride in difficult meta-goals (for me, stuff like completing a battle without dying or taking out a group's healer) than because the battle itself is engaging. The actual battle-zone is absolutely lovely though, really interesting to fight in, small enough that you don't feel isolated from the other objectives but large enough that there's room to manoeuvre. The bases themselves are filled with enough wide open space to be fun but enough line-of-sight and multi-level stuff to allow for some tactical play – it's hilarious hiding behind a pillar until the defenders run off to another base, or sneaking in behind a group of wall-top defenders facing frontwards 🙂 If the rewards and objectives were tweaked I think it could be one of the best PvP spaces yet, though I doubt it'll ever have quite as "epic" a flavour as the vast, icy sweeps of Wintergrasp. I’m going to be staying far away from this mess till they sort something out. Not being on the ground yet I guess I’m not in a position to say but…what if you just had to hold two of the three towers instead of all of them? That would force defence to slit up. Or if you made the central gy capturable (insurgent strike force woo!) which would force defence to actually, ya know, defend the keep as well as going out to grab a tower, instead of having everyone just zerg out to a base like defence currently (so I hear) does? Both of those ideas would certainly work. I like making it best 2 out of 3, which would change the strategy to be one of guessing where your opponents will be weakest instead of throwing your hands up in the air and racing mindlessly from one base to the next. I’m staying away, too. There are, frankly, better places for me to spend my time in game. If the defense only has one spawn point maybe sending a group to camp that res point would be enough to cripple them? This sort of works, but the defending team rezzes on a big hill. You’d have to guess where they’re going. Some people on my side (Horde on my server never has control) have a theory that a combination of camping the mid and dominating the bases would = a win. But frankly, as Cyn has already pointed out, it’s just not worth the hassle. I don’t think TB is *that* broken atm. The towers will become more meaningful once TB becomes slightly more skewed to attackers. If say each minute, the attackers have a 1% chance of winning, then over 10 minutes the chance is still low, but once extended to 30 minutes it becomes more respectable. (On another note I think a 30 minute long fight time is far to long). The problem is that other in balances manifest themselves as the towers doing nothing. If you can’t win, then 20 minutes extra time does nothing, you still can’t win. If you have a chance to win, then 20 extra minutes gives you more time to pull it of. I also think that putting in a second win condition will go a long way. At the end of TB who ever controls the most towers wins. Granted just inserting that rule now would just lead to a last minute zerg, the nodes need to be easier to defend. Perhaps have each node provide some form of buff, and don’t make them easier to defend? There are two kinds of broken battlegrounds. I realize that I’ve used that term a lot in the past few months, and not always with the care I should have. The Isle of Conquest was broken in 4.0.1 because it was bugged. The battleground’s design was fine – good, but not great – but the code itself was broken. The Hangar would kill you and the Alliance had to get around big pink blocks. That’s broken due to bugs. Tol Barad is flawed. Maybe that’s a better way to put it – the design of the game is flawed. It’s not the core idea that’s flawed, but the implementation of it, and there’s no indication that Blizzard intends to fix it. The core idea – capture all the bases and hold them for a certain period of time – is fine. The capture mechanic, though – raw numeric superiority at a location, instead of actually dominating a fight or capturing a flag – renders it problematic. If you change the capture mechanic, or change the victory conditions, you fix the design flaw. The other flaw that I probably should have spelled out more clearly is that the PvP incentive isn’t there. Wintergrasp presented a great way to gear up your toons for PvP. Tol Barad… doesn’t. Ok, lets try this again. I guess I went over solutions without really talking about what I think the problem is. The root of the problem (I believe) is that the nodes don’t get defended. Is this because they are to hard to defend, or because theres no incentive to defend them? This apply’s to both sides. When you can figure out which it is, then you can begin to look at solutions. For example in AB, the points are fairly open (as such a pita to defend), but theres incentive for holding them (points). There’s no incentive for the defenders to stay and defend. You use a water defense – as you get hit, you flow to another location. As defenders die at one node, they die and go to another. The attackers, by contrast, HAVE to defend all nodes taken, which weakens their offense further. It’s not just that there’s no incentive to defend multiple nodes; it’s actively detrimental to do so because of the capture mechanic. Exactly. I think once that problem is fixed through either tieing the victory conditions to controlling nodes (Eg AB) or through making them desirable to hold (eg you get a 10% damage buff for each node you hold) that a lot of the other parts of TB will fall into place. Tol Barad is indeed brutal for the attacking faction. For Proudmoore Horde this is a blessing. Prior to the last few weeks of the expansion, we managed to win WG 1-3 times a week. It was like this for the entirety of WotLK. No amount of Tenacity would help when you were outnumbered 15 to 60+. For Horde on Proudmoore, WG was a nightmare, and for the last few months only the most masochistic of players would dare to set foot in the zone during battle time. WG was absolutely atrocious for factions that were heavily outnumbered. The limit on numbers of players in TB is the single greatest change they could have made. The larger Alliance population had control of Tol Barad for the first week of Cata, but since then Horde have defended it in a frenzy and held it without loss. We consider this our moment of redemption, recompense for the two year long beatdown we suffered in WG. The Alliance are foaming at the mouth with anger at the circumstance they currently find themselves in. Their cries on the forums are met with zero sympathy. I agree that Tol Barad is currently broken, but for some factions, on some servers, this suits us just fine. I’m guessing roughly 50% of people feel exactly the same way…. Having done Tol Barad from day 4, I share the perspective that Tol Barad is broken for many of the reasons stated above. I’d add that faction imbalanced servers (due to the force-size balancing) and low pop servers are even worse off. Tol Barad was clearly designed to be a mass encounter, where moving portions of large groups can tip the balance at a node. When the numbers of players are low – and there are servers out there today where fights are 5 on 5 – the capture mechanics break entirely because of the length of time it takes to flip a node. I think Blizzard needs to weight the capture times to match the overall number of players in the battleground. Also, two general rules I would LOVE to see Blizzard live by. First, design no battleground where a zerg strategy can be effective. Second, never make the rewards for participating in battlegrounds primarily PVE-related. I dunno, what I miss the most about WG is the feeling. In WG we launched a great siege on a fortress, in tol barad we capture flags… really now? It seems that blizzard had no clue what made winter grasp a success in the beginning really. On the tactical level WG might or might not have been a good bg, but it doesn’t matter, it was filled with so many nabs so tactic and organization never happened. but what it did was giving everyone the feeling of participating in an epic battle. Tol barad does not. and never will because the objective doesn’t feel real and the fortress you attack doesn’t look like fortress. When I get my honor points and my dragon I’m probably never going back there again. I haven’t had the opportunity to do Tol Barad (haven’t dinged 85 yet), and if it’s as stated, I’ll pass. But WG, the few times I’ve been in WG when the teams were even close to even in number definitely fun. The majority of them were 15 Alliance to ?? Horde. Yesterday in fact queueing for a random accidentally hit WG, so thought what the heck. Six Alliance players against ? Horde. Thankfully it was quick. Even on my Horde side when there are few Alliance queueing up it was a yawn. I wish Blizzard had WG queue in groups of 10-15-20, it would at least make it a bit equitable, although still favoring the defenders, it wouldn’t feel like a waste of time. Tenacity keep it I’d rather have a fighting chance, as even with tenacity getting clobbered by 20-30+ of the opposition doesn’t help for long – makes you feel like a raid boss : P.
The epic fight Blizzard has been aiming for just falls short on too many servers unfortunately. I’ll stick to WSG, AB & AV or do the random that pops. I’ve been doing Tol Barad a bit the last few days, and I agree with you here. It’s definitely broken. I’ve never been there when possession switched sides. When I was attacking, I just got frustrated when I saw how easily the defenders took back a node we just captured. When defending, I was almost bored at how easy it was to keep the attackers on the run. I guess it changes hands in the middle of the night when no one is really playing, or something. That is AWESOME. This story seriously made my day. I will venture into Tol Barad (which is awesomely frustrating to attack by the way) just so you can kill me again! Say, would you and/or your guildmates be interested in helping me out with an experiment in Tol Barad? There’s a nasty rumor about balancing I’d like to either prove or disprove, but I need help on the horde side of Durotan to get the evidence I need. Let me know if you’re interested – either hit me up through one of my contact addresses, or I’ll roll a Horde toon and come to you. I could sure use the help!